Habits are the distinctive form that mineral crystals may take in different geologic settings. It refers to the differences in form when they grow in a free space compared to growing in a particular environment, for example. A habit can be a strong clue to a mineral's identity. Here are examples of some of the most useful mineral habits. Note that "habit" also has a meaning for rocks. Acicular means "needlelike." This mineral is actinolite. Amygdaloidal means almond-shaped, but it refers to the former gas bubbles in lava called amygdules, which are cavities that have become filled with various minerals. "Banded" is a broadly layered texture. 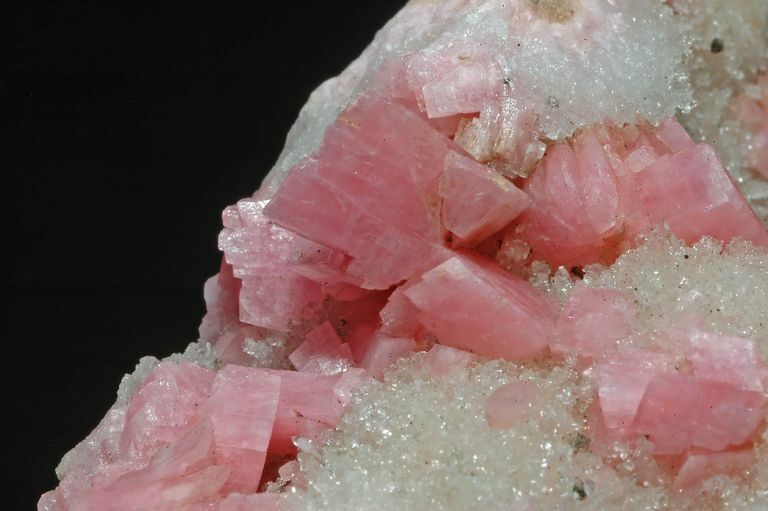 This rhodochrosite specimen might be called stalactitic, lamellar, geode, or concentric if it were curved differently. Bladed crystals are longer and thinner than tabular crystals but stubbier than acicular crystals. Kyanite is a common example. In rock shops, look for stibnite. A blocky habit is squarer than equant and shorter than prismatic. This mineral is pyrite on quartz. In scientific Latin, botryoidal means "like grapes." Carbonate, sulfate, and iron oxide minerals tend to have this habit. This specimen is barite. The cruciform (cross-shaped) habit is the result of twinning. Staurolite, shown here, is well known for favoring this habit. Dendritic means "like branches." It can refer to flat crystals, like those of manganese oxides, or three-dimensional forms like this specimen of native copper. Druses are a type of opening inside rocks that are lined with projecting crystals. Amethyst, cut from geodes, is commonly sold in rock shops for its pretty drusy habit. Calcite, the main component of limestone, commonly dissolves to be deposited elsewhere as a crust. Chips in this specimen show how it coats the underlying rock. Crystals of nearly equal dimensions, like these pyrite crystals, are equant. Those on the left might be called blocky. Those on the right are pyritohedrons. Rutile is typically prismatic, but it can form whiskers as in this rutilated quartz. Curved or bent fibrous minerals are called capillary, or filiform, instead. Geodes are rocks with open cores, or druses, lined with different minerals. Most geodes contain quartz or, as in this case, calcite with a drusy habit. If crystals are not well-formed, what might otherwise be called an equant habit is instead called granular. These are spessartine garnet grains in a sandy matrix. Lamellae are leaves in scientific Latin, and a lamellar habit is one of the thin layers. This gypsum chunk can readily be pried apart into crystal sheets. The quartz in this gneiss boulder has a massive habit, with no individual grains or crystals visible. Caution: rocks may also be described as having a massive habit, too. If you can, use a more appropriate term like equant, granular or blocky to describe them. Minerals that split into extremely thin sheets have a micaceous habit. Mica is the prime example. This chrysotile specimen from an asbestos mine also has thin sheets. A platy habit might be better described as lamellar or tabular in some instances, but this thin sheet of gypsum can be called nothing else. Prism-shaped minerals are common in granites. Tourmaline's nine-faced prisms are distinctive and diagnostic. Very long prisms are called acicular or fibrous. This "pyrite dollar" grew from a central point, squeezed flat between shale layers. The radiating habit can have crystals of any form, from blocky to fibrous. Reniform refers to being kidney-shaped. Hematite displays reniform habit well. The fracture shows that each round mass consists of radiating small crystals. Rhombohedrons are bent cubes in which no corner is straight; that is, each face of this calcite grain is a rhombus, and there are no right angles. Rosettes are groups of tabular or bladed crystals arranged around a central point. These barite rosettes are composed of tabular crystals.